News piece headlined “EVICTION!” hang above the audience’s heads alongside pictures of Hawaiians standing in protest to various land debates. In the playbill, playwright Gary Pak points to flashes of Hawaii history, citing Kalama Valley and the Waiahole and Waikane Valley as director Harry Wong III mentions that this is not meant to be “a historical document,” but a “fleeting grasp” of how the land struggles of the 70’s and 80’s felt. A tumultuous and arguably transformative time for native Hawaiians, this period of history tested the mettle of the remaining Hawaiian people and their communities. Pak’s The Watcher of Waipuna may not take place in a physically “real” location, but still evokes the very real tensions and following resistance that the land struggles of the time brought about. The fourth production in Kumu Kahua Theatre’s 2018-2019 season, The Watcher of Waipuna is a literary adaptation. Pak writes prose, having written three novels and two short story collections, the latter of which The Watcher of Waipuna is a part of. This is the second time Kumu Kahua has done The Watcher of Waipuna, with the first literary adaptation being Maui the Demigod (1991). Using Pak’s text as a jumping off point, Wong and the company breathe a new life to his short story, adding more voices and performative elements as the company shares the whole duty of telling the audience about Gilbert Sanchez and his adventures down by Waipuna Valley. This provides a real sense of community that is honestly felt throughout the performance as the company comes together to tell the story, sometimes with voices in concord and unison, sometimes… not. However, that is part of the magic of storytelling and the stories we pass on through the generations, and it captured beautifully here. The Watcher of Waipuna follows the story of Gilbert Sanchez, played by Eddy Gudoy, Brandon Hagio, and Kirk A. Lapilio Jr. The three men bring Gilbert to life as different slices of the same man, of what he may see himself as versus how others see himself as versus who he really is (this is a personal theory). 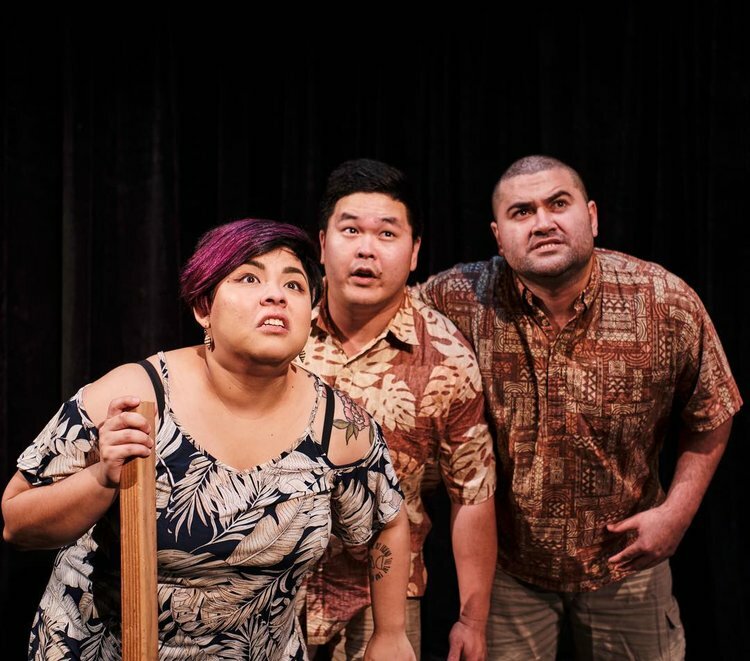 The three play the same character yet each brings a delightful nuance to Gilbert, and together tell the story of how he is the one hope Waipuna Valley has against the power of greed and money (and frogs). Conjuring supernatural elements, flashbacks, weather conditions, onolicious food, and the entire community, family, and business that swirl around Gilbert are the talented chorus team. Samantha Fukushima, Kahana Ho, Lelea’e “Buffy” Kahelepuna-Wong, Po’ai Lincoln, Darryl Soriano, and Nicole Tessier come together to be everyone and everything else in Pak’s story, and what a job they do. With finesse and ease they transport the audience to a sleazy businessman’s Waikiki hotel to Waipuna and the Nakakura General Store that delivers groceries to the Sanchez residence to dreaming about all the ono kine food Aunty can make. Amid the dozens of characters, locations, and events that happen, the chorus alongside the three Gilberts bring a new voice to the text, adding small cutaways, sounds, and smells that you may envision in your head when you’re reading Pak’s stories. The company has a beautiful chemistry that shines in their storytelling, and it is heightened even more with the ways they transform the stage. Armed with very little props and a bare stage, the cast takes us to the very heights of where Gilbert must look for his “signs” all the way to the bottom of a seaside cliff, with the waves crashing and a storm only beginning. Lighting designer Cora Yamagata helps give that extra oomph to the storytelling when the actors need it, providing a very dramatic and theatrical turn to the storytelling. As stern as this review started off as, this play encourages you to breathe, laugh, and listen. True, the performance is beautiful, but Pak’s writing also shines as a parable of what has happened , which still has echoes and is happening in its own way, today. The veneer of the comedy may wane as you witness the dealings that Gilbert’s own family does with mainland businessmen, but it never wanders away for long, allowing you to both enjoy the fun and energy while taking in the brevity of some of the bigger subjects at play, like corporate development, connections to home and the land, and displacement of local communities. Make sure you catch The Watcher of Waipuna at Kumu Kahua Theatre, running through April 20. For tickets, click here.